The summer’s here! As well as basking in the beautiful weather in Taborea, we’re celebrating the dawn of a new era: Runes of Magic is now available on the world’s most popular gaming platform Steam! When I say “at last” it isn’t as though I was anxious for it to be there, it is just that they have been talking about this for some time and the target was June and then July. Now, in the final week of August it has arrived on Steam. Summer is indeed here, but we’re on the far side of it and autumn is on its way. I’ve written a bit now and then about the game. It was kind of a big deal back in 2009 when it launched, when it was both a built-from-scratch free to play MMORPG and an attempt for an attempt by an Asian studio to build a western style, quest drive game. But, as it turns out, this move to Steam is also a moment of opportunity if you have ever wanted to try the game. As part of the Steam launch they are also putting up a couple of new servers, one in the US and one in the EU, so you can start on a fresh new server rather than joining one where the years have clumped most of the user base at max level and the economy has been distorted by past problems. Your favorite game is now available on Steam! In addition, we’re also launching new servers for the USA and Europe to coincide with the game’s Steam debut – the perfect opportunity for newcomers and returning players to discover Taborea afresh. This is probably as close to a retro or progression server as you are going to get for Runes of Magic. The devs haven’t changed much of the content over the years, so it is mostly still the 2009 experience. And you can still use your same old account. In fact, you have to create an account for the game in the same old way, with Steam basically acting like a launcher for the launcher in that way that makes Steam feel a pointless part of the process. I do wonder what this move to Steam will really do, if anything. The “at last” in the title is also a question about why it has taken so long to get to Steam, why it is happening now, and what they hope to get out of this jump onto the Steam platform. I hope they aren’t planning on this saving the game. Steam has gone from a service with a fairly select range of games to a garbage heap over the years. It is the last refuge for the greedy or incompetent who seem to think they getting on a distribution platform is the main point of the exercise. And Steam’s premature policy change (we’ll let even more crap in now and give you filtering tools at some point in the distant future) doesn’t promise to make anything better. It is a mess, with the company still pretty much running by the old guidelines while people debate over what “trolling” really means. Anyway, there is Runes of Magic hidden in that mess, one of dozens of “new releases” on the Steam store this week (so it is already on page four, in 98th place, on the Windows new releases list in less than two days), with a 2009 launch date in its description, and already being pummeled by a series of negative reviews declaring it old (it is), unstable (it does leak memory), and pay to win (it does sell power), leading it to an overall “mixed” rating, which is as good as a “do not buy” label in big red letters across the page. If the developers were hoping for a bonanza of new players I suspect they may be disappointed. But it is hard to tell what the real plan is from the outside. Is this a last gasp effort to keep the ball rolling? Certainly the new server thing was contrary to my prediction about the game at the start of the year, when I suspected that it would lose at least one of its two remaining servers, with the very quiet US server either disappearing or being merged into the EU. Instead they have doubled the number of servers they are running. We shall see if this keeps Runes of Magic alive or if it was just a last, unfortunate roll of the dice. This entry was posted in entertainment, Runes of Magic, Steam on August 30, 2018 by Wilhelm Arcturus. @Nogamara Oh no, RoM had an exceptionally bad patcher. 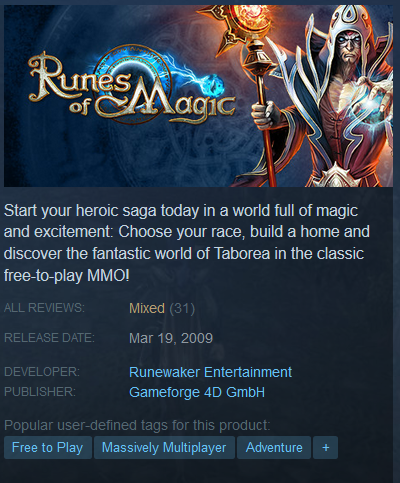 If you click on the “Runes of Magic” category and look at my posts about the game, you’ll see me complaining about the patcher in 2009 and then again about how the patcher did not change at all when I tried the game again in 2017. I can’t really tell you why this game is on Steam now. It’s super old, not really a great game, and there are loads of better non P2W F2P games. Pretty sure I would play the F2P version of Guildwars 2 over RoM. Pretty spot on analysis though. I never really liked RoM first tiem around. It was before i started blogging so I have no record of what i thought but I remember finding it mostly quite dull. It was also untranslated once you got out of the starting area but I am guessing they got around to that eventually. There are loads of actually rather good F2P Eastern imports around these days so I really don’t see who’s going to play Runes of Magic. I’m going to go back and play Twin Saga soon, I hope, which is a F2P with great graphics, an interesting story and some surreally funny quests. Even when Runes of Magic was new, though, there were better F2P imports – Silk Road and NeoSteam both predate it and both had a lot more going for them. It really is surprising RoM is stil with us. What is the bottom line cost for them to run another server and basically do no updates? It can’t be that much. @Sleepysam – There had to be some effort involved in integrating with Steam and meeting Valve’s requirements, otherwise it would have hit in June as was initially discussed. And honestly, who can say if even spinning up a new server was easy. It has been a long time since they last did so. They might have spent most of the time trying to get that to work right. We’ll see if it was worth the effort I suppose.